Our hearts are rainbows painting frequencies on the canvas of the invisible. Our thoughts released from within, in turn, go out and sound out a song. Some songs we humans sing are happy, other songs might be sad and some songs can be dynamic; having a long grievous pause followed by a powerful pierce of joy. The joy that emerges after a good cry or mournful winter is likened to the sun peaking through the clouds after a good rain. 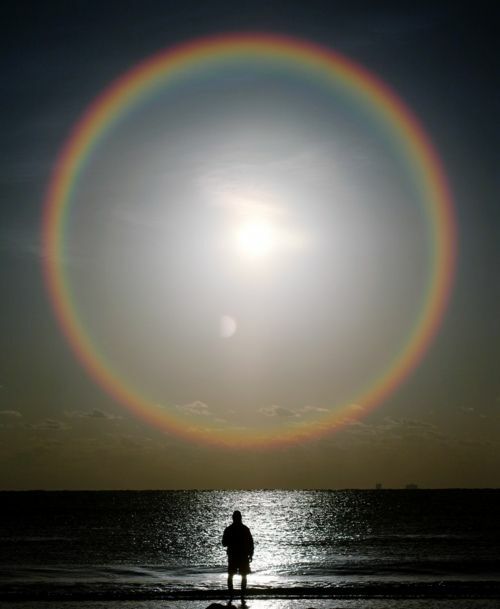 The rainbow that follows is the effect of the joy that becomes brilliantly obvious. Joy, much like rainbows, is actually always there in everything and within, it’s just that life, the walls we build and the fears we unconsciously give power to can cover our joy up for a time. A rainbow is best seen from a specific angle by the observer after the rain. Did the rainbow just appear, or is the observer just seeing the rainbow because the weather circumstances framed the scene? Easy answer, the rainbow appears because the light is being refracted and dispersed through the prisms of water drops. The rain doesn’t solely bring the rainbow, the sun doesn’t alone bring the rainbow…the spectrum of light is always there. It’s the light that allows for the rainbow to be seen. Our light, our joy can emerge within if we bring our minds and hearts into alignment with Universal Laws, knowledge of forgiveness, unconditional love and a conscious vibration to send out the thoughts to manifest what we want. What we want is possible, we must focus on the person we desire to be to then create the weather circumstances (our thoughts) to see the rainbow, take diligent action in faith towards that end and practice the skills needed to become that person we desire to unmask. The unveiling occurs as we in daily effort pass by, release, out-smart, forgive and politely dismiss the ego again and again as we ascend in humility, knowing it is by God’s grace we awake. We are responsible for our thoughts, which means we are responsible and must be accountable to the vast intelligence created by the Grand Instructor. It is because of the law of gravity that we walk on the ground and likewise it is because of the invisible intelligence that permeates the cosmos that we have the potential to manifest joy. Wonderful blog and so well written. Thank you for your insights!